I made these cupcakes last night to celebrate my first week as a MS3 being over. I had a great week, but it will definitely take some time to adjust to the long days. These cupcakes are pretty rich, partly because I did so much quality control while making them that by the time I actually ate a finished cupcake I was already on a sugar high. But I mean, I had to make sure the Snickers were fresh and that the icing was good, right? haha You have to plan ahead a couple hours when you make these because the Snickers are frozen when you put them inside the batter, but it’s totally worth it. 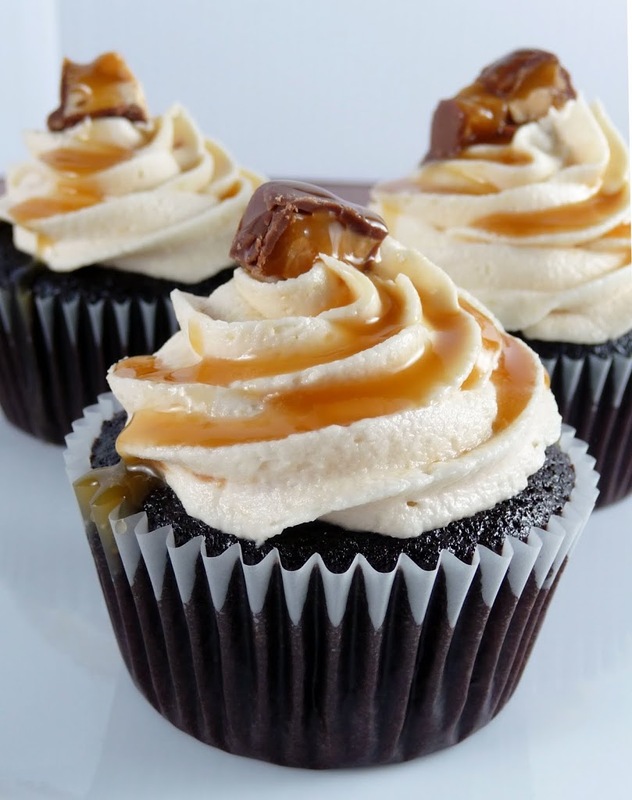 A miniature Snickers surrounded by chocolate cupcake, topped with caramel buttercream….need I say more? =) Enjoy! 2. Line muffin tins with paper liners (18). 3. Place chocolate and cocoa in medium bowl. Pour hot coffee over mixture and whisk until smooth. Cool slightly, about 5 minutes in refrigerator. Whisk flour, sugar, salt, and baking soda together in medium bowl; set aside. Whisk oil, eggs, vinegar, and vanilla into cooled chocolate-cocoa mixture until smooth. Add flour mixture and whisk until smooth. 4. Divide batter evenly among muffin pan cups. 5. Gently push a frozen Snickers Miniature bar into the center of the batter and smooth the surface making sure to cover the candy bar with batter. 6. Bake for 15-17 minutes, or until edges are springy to touch and center is almost set. 7. Cool cupcakes thoroughly on wire rack. 1. Cream the butter in the bowl of an electric or stand mixer. Add the vanilla extract, and caramel syrup and combine well. 2. Begin adding in the sugar and mixing thoroughly after each addition. After all of the sugar has been added and mixed thoroughly, give it a taste and decide if you want to add in more caramel syrup. For thicker frosting you can gradually add in a little more sugar. Garnish with chopped Snickers bars and a drizzle of caramel of caramel syrup.